The final utilisation goal of this TBM-project is to limit the impact of a vestibular dysfunction on the (motor) development of children. Since hearing-impaired children have a higher risk for deficits of the vestibular (balance) organ, we will focus on this vulnerable group. 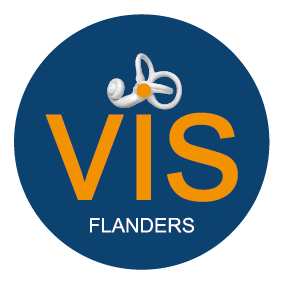 The implementation of a standard vestibular screening protocol in Flanders in hearing-impaired children at the age of 6 months, enabling early diagnosis of vestibular deficits and adequate referral for extensive vestibular testing, motor assessment and rehabilitation. Increasing the awareness for vestibular dysfunctions and its associated symptoms in hearing-impaired children among parents, teachers, paramedics, specialists and other social workers who are in close contact with hearing-impaired children. This should go hand in hand with more effective patient care, because adequate therapy will start sooner. Determination of the prevalence of vestibular deficits among congenitally hearing-impaired children in Flanders at the age of 6 months, based on the results of the cervical vestibular evoked myogenic potential (cVEMP) technique. Determination of the sensitivity of the cVEMP as a screening test in detecting vestibular dysfunctions in hearing-impaired children at the age of 6 months, which will be achieved by comparing the results of the cVEMP with the results of a more extensive vestibular and motor assessment, in order to enhance the accuracy of the vestibular screening protocol. Determination of normative data for the cVEMP response parameters in a group of typically developing normal-hearing children at the age of 6 months, in order to provide the reference centres with cut-off values for an accurate interpretation of their screening. In case of a ‘refer’ on the second MAICO test, Kind en Gezin (Child and Family) will refer the child to the reference centres of Kind en Gezin in Flanders. 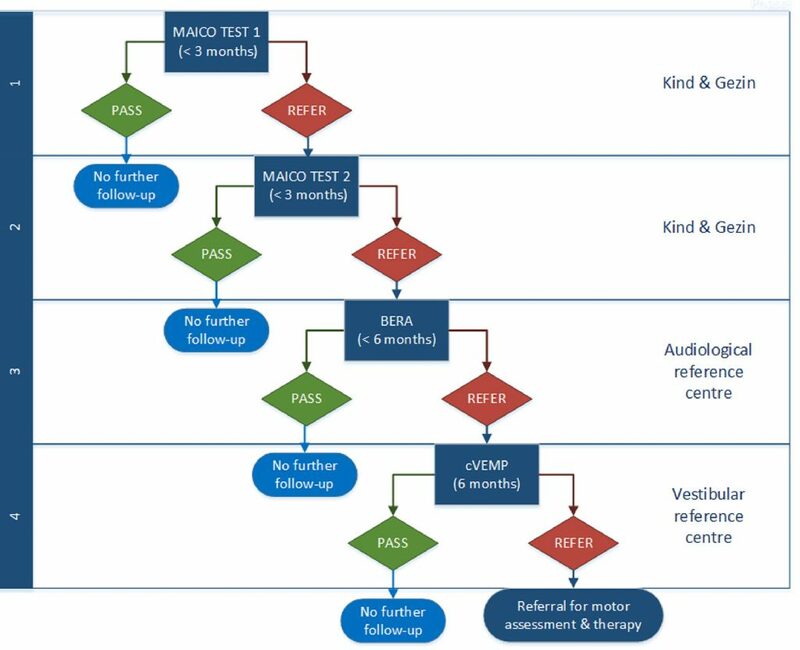 These reference centres will perform a diagnostic hearing test (brainstem evoked response audiometry: BERA) to confirm the permanent hearing loss. Each child with a confirmed hearing loss (BERA ‘refer’) will be subjected to a vestibular screening in that specific reference centre at the age of six months. The cervical vestibular evoked myogenic potential (cVEMP) technique will be used. In case of a refer on the vestibular screening (cVEMP ‘refer’), the reference centres will refer the child for motor assessment and, if necessary, for rehabilitation. In Flanders, the hearing of newborn babies is screened using the MAICO test. This is an objective screening test which measures brainstem activity in response to auditory stimuli. We also need a reliable, fast and easy test to accomplish a vestibular screening. Therefore, the cVEMP seems the most ideal and feasible test to be used as screening tool. A part of the vestibular organ will be stimulated with sound vibrations and tested by holding a small device (bone conductor) behind the ear. This test measures ipsilateral inhibitory potentials of the contracted neck muscle by using surface electrodes. Scientific research has indicated that the part of the vestibular organ tested by the cVEMP, shows the highest risk for vestibular dysfunctions in children with hearing loss due to problems in the inner ear. Moreover, own research demonstrated a strong correlation between cVEMP testing and motor performance. The cVEMP is also a non-invasive, objective and short test, which can easily be applied at the age of six months. December 2017 – February 2018: All Flemish reference centres will be contacted at the beginning of the project in order to make organizational arrangements. Additionally, the application for approval of the Ethical Committee will be submitted in order to collect and process data from the different reference centres. The rehabilitation centres will also be consulted and an extensive study of literature will be executed to set up guidelines concerning the content of vestibular rehabilitation programmes in hearing-impaired children. March – May 2018: During the next three months, further arrangements will be made with the reference centres of Kind en Gezin (Child and Family), other rehabilitation centres and physiotherapists in the periphery. By organizing a symposium about diagnostics and rehabilitation in hearing-impaired children with vestibular problems, guidelines about the frequency, choice, duration and evaluation of the therapy will be given. Furthermore, normative data of the cVEMP test will be collected in typically-developing normal-hearing children at the age of six months in order to provide the reference centres with normative values for a correct interpretation of the screening results. From June 2018: The implementation of the cVEMP as vestibular screening in hearing-impaired babies at the age of six months will start in June 2018 in all Flemish reference centres. Appropriate referral for rehabilitation will be provided.